Click the button below to add the 1/8" Nature's Woods Rustic Paneling 4 x 8 to your wish list. The panels are shipped on a Common Carrier truck (an 18-wheeler) because the pallets are too large to ship UPS or FedEx. When we have a residential delivery, the carrier will phone as the shipment nears its destination terminal to make a curbside, at the street, delivery appointment. You should have able-bodies people there to help with the delivery. You should also perform a shipping damage inspection, and you'll need someone to help you move product from the curb up to the house. Normally, residential deliveries will be on a truck with a lift-gate to help bring the paneling skid to the ground. Nature's Woods Rustic Paneling features outdoor scenes, with deer and fowl images for a rustic look. 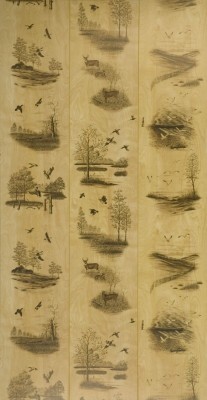 Each Nature's Woods panel has several smaller mixed images in random positions on light birch. Sometimes referred to as Deer and Duck paneling. Channel Grooves set every 16"
The paneling is outstanding! Great quality and color. I wish there were more deer in it, but it's outstanding. Shippment was quicker than we anticipated. NO DAMAGE!! The way it was bundled on the pallet was as if they were getting it for themselves. Keep up the great work and I'll be ordering more of the same in a couple more months, when I retire.